Coffee tables were their only defence! Drawing one sexual position on the cover is bizarre enough, but drawing the same one eleven times is too much. Those just might be the most vision-constricting space helmets I’ve seen on the fine site yet. Unfit for landing an Art-Deco, perspective-challenged rocketship OR blasting måne-mennesker. Yes, it’s the Raket and Skibet show! Join these two zany moon men as they defend their godforsaken hunk of rock from invaders flying the most ornate spacecraft ever designed! Thursday at 9 pm on SCTV. @ Lillie Awesome: at least they didn’t stick cow-horns on. @DSWBT #2 – That is a famous Kama Sutra position called the “Kunstforlag”. I am assuming those wiener dog centaurs are the publishing house symbol. If so – WTF. If not – WTF. Looking at the Earth, It appears that Trump has annexed Mexico and broken off contact with South America. ‘Raket Skibet’: how Hong Kong gambling syndicates ruined Nordic Cross-Country Badminton. Just another gripping tale of space colonialism with nudist aliens! No biggie. Also, those spacesuits are ugly. And that ship looks like an art deco winged bird – cool-looking, but ultimately impractical. Rise up on interior of Skibet’s flat. Skibet is asleep sprawled out on the chesterfield. Enter Raket. Raket crosses the flat and shakes Skibet awake. Raket: Skibet! Wake you up, Skibet! Skibet: Aah! I am awake! I am awake now, Raket! Applause. Skibet rubs his hands against his face as Raket stands impatiently. Skibet: What is the matter, Raket? Raket: Skibet, you will never guess what tragedy has happened! Skibet: No, I guess I won’t. Skibet: What has happened, Raket? Raket: The astronauts, Skibet! The astronauts are invading right now, as we speak! Skibet: WHAT did you say, Raket? Raket: The astronauts from Earth, Skibet! They are invading! With rockets, and pistols, and everything! Skibet: Why, I never would have guessed! Skibet: Listen, Raket. There is no time to waste. We must get the guard at once. Skibet: And Raket, they must bring their table-tops with them. Skibet: And we must, Raket, we must repulse these invaders for sure! THIS time! Raket: Yes, Skibet. But one more thing, please. Skibet: What is it, Raket? Raket: Skibet…we must keep this a secret from my hot Chinese girlfriend. Skibet: Of course, Raket. Of course, we will keep this all a secret from your beautiful girlfriend. I promise we will. Yutu: WHAT’S GOIN’ ON IN HERE, BOYS? Raket, what on Moon are you doin’ hangin’ out with Skibet again? I tol’ ya a hunnert times, he’s no-good! Raket: Er, hi, Yutu. We weren’t doing anything. We weren’t doing anything at all, really. Yutu: Oh, yeah? Well, what you come over here for, then? Skibet: We were just only planning a picnic. Yutu: A what? A picnic? Raket: Yes, of course, my dear. Raket: We can go to the greengrocer’s, and get some cooking materials, and make sandwiches for the three of us, and then go on a picnic. Yutu: FOUR of us, you mean. Yutu: Oh, didn’t I tell you? My mama’s comin’ to town. I gotta go pick ‘er up, and I’ll meet you two meatheads for lunch. Skibet and Raket wince. Laughter and applause. Exeunt Yutu. Skibet: Oh, Raket…why the astronauts have to invade TODAY??? @fred: Not only has Mexico got a big gouge through it, it’s lost Baja California. Also, this is the blandest title ever. You’d think a DANISH skiffy book would show the side of the Earth where Denmark is… but nooo! They play it safe with the ol’ “America is the only continent of Earth” trope! Bloody favoritism! 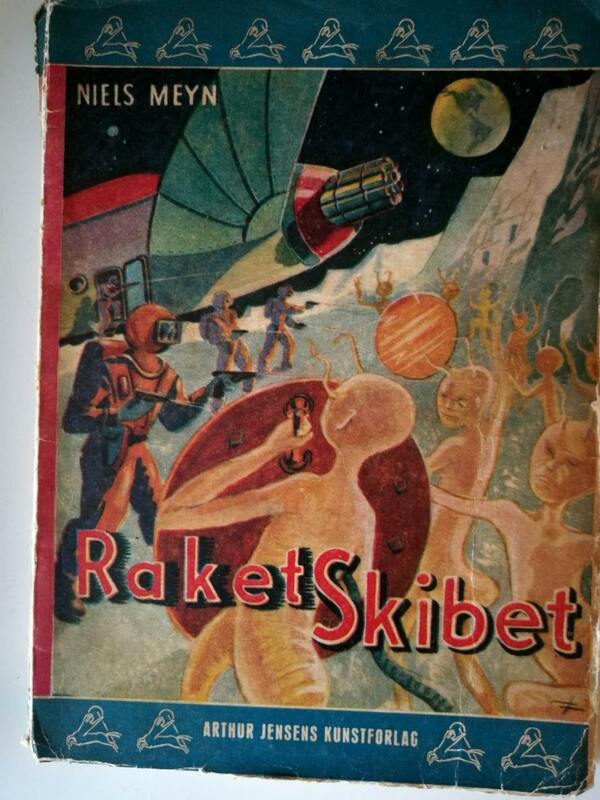 “Raket Skibet” means “The Rocket Ship”. Published in 1944? Denmark (and Norway) were then under occupation by Nazi Germany. Perhaps a propitious time for some escapistic science fiction entertainment? Or does the book contain elaborate anti-Nazi allegories? I don’t know, since I haven’t read “Raket Skibet” and most likely never will. Oops, sorry… According to the Wikipedia article Niels Meyn was in fact a Nazi sympathiser during the occupation. That’s a shame.